Following the spectacular launch at the Rijksmuseum in May 2015, online magazine The Green Gallery is enjoying a rebirth, this time at the Salone de Mobile, the leading international interiors and design trade show in Milan. The sixth issue of the online magazine will be launched on 4 April 2017, which is - not entirely coincidentally - the opening day of this trade show. Inspired by the infinite beauty of nature, The Green Gallery is creating a magical oasis at the Wallpaper* Handmade exhibition in collaboration with The Wunderkammer. The garden of the Mediateca di San Teresa will be transformed into an enchanting floral world for six days to mark the occasion. “With this natural art installation we invite you to enter The Green Gallery’s floral world, which will enchant you and leave you silent and astounded. A world that leads you to the ground-breaking Le Refuge.” – Esther de Waard, The Green Gallery. 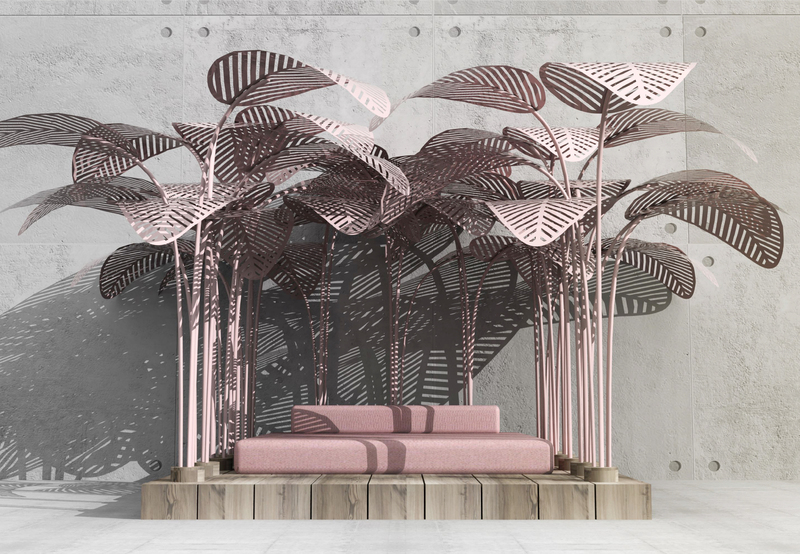 Le Refuge is a unique piece of designer furniture from designer Marc Ange which will be exhibited for the first time in Milan by The Invisible Collection. “Le Refuge is a place where you find peace and comfort. It is the projection of a childhood memory. The large leaves form a sanctuary beneath the sun, away from reality, just like the imaginary jungle that grows in the room of the child wants to escape the fallacies of everyday life.” – Marc Ange. The Flower Council was approached by The Invisible Collection some two months ago with the suggestion of jointly exhibiting Le Refuge at the renowned Salone del Mobile. The Flower Council of Holland’s online magazine, The Green Gallery, has created an exclusive flower and plant installation for this, which has been executed partly thanks to the enthusiastic co-operation of many growers and exporters. Online magazine The Green Gallery will come to life for six days at the Wallpaper* Handmade exhibition during Salone del Mobile 2017. The spring issue of The Green Gallery will also go live officially on 4 April, and is focused on spring awakening, with a love for nature, mystery and botanical splendour. Rare and unique items of furniture which were previously only accessible to professionals and an elite customer base are being offered online to a wider audience for the first time by The Invisible Collection. The website curates exclusive items of furniture created by French and international icons and talents from the 21st century. www.theinvisiblecollection.com. Parisian designer Marc Ange was born in Rome. His family history is surreal, suffused with art, religion and insanity. His youth left him with a conscious confusion between reality and imagination which recurs in all his creations. In his home city of Los Angeles he creates art for those who share his tastes. His mission is to make life into an artwork. Marc Ange's clients include Jean Paul Gaultier, Louis Vuitton, Ferrari and Moet & Chandon. The installation in the garden of the Mediateca de San Teresa has been designed and created by The Wunderkammer on behalf of The Green Gallery. The Wunderkammer are master florists who present the best of flowers and plants in everything that they do.